Jewel, also known as Ms. Gypsy Soul, began downsizing to create "a lifestyle that would allow me to travel and enjoy life more, to be free(er) and less obligated so that should I happen to decide I want to relocate it takes less effort and is less expensive." In ten years, she was able to move from a 4 bedroom/3 bathroom home to a 1 bedroom/1 bathroom apartment — but that still wasn't small enough. As a natural progression, Ms. Gypsy Soul found happiness in a tiny home. On her Facebook page, she lists answers to frequently asked questions about her breathtaking home. The 360-square-foot home is perfectly tailored to her needs, which she illustrates on her website: "My tiny house had to be something that represented me and my lifestyle, with lots of light and windows, to include everything on my list of the must haves that I deemed important – and hopefully some of the wish list items, something that made me happy… and it had to be funky!" This tiny home is suited for travel, should she decide to relocate, and both the porch and balcony collapse to make the trip easier. Because of the screens, this porch allows Jewel to enjoy the outdoors no matter the season. The large window lets in plenty of light, adding to the airiness the carefully-chosen decor creates. The mirror is actually a space-saving sliding door to her bathroom, and the ladder up to the loft seems like wall art behind the couch. The full bathroom even features a washer/dryer combo unit! This is the view from the reading nook. And this is the view from the sleeping nook. Note how the punchy red accents liven up the space. This reading nook is the ideal place to daydream. The fold-down table is equally suited for mealtime, work time, and play tme. Jewel's full kitchen is sure to spark envy, regardless of how much you actually cook. Everything is so streamlined and modern, and the graphic black and white decor contrasts beautifully with the warm red decor in the rest of the house. Are you swooning? I know I am. Look at that gorgeous tiled backsplash. The stairs that lead up to the sleeping nook are a work of art. The sleeping loft can accommodate a king-sized bed! Talk about living large! 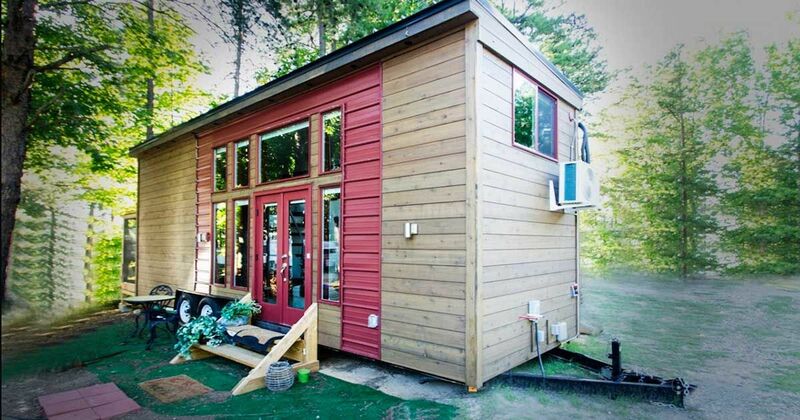 In her interview with Tiny House Talk, Jewel reflects upon what she's learned through the process of downsizing and building her own tiny home: "My build helped me realize I know more and am stronger than I often give myself credit for. I’m 4 months in and I still love my house, which is a great feeling of knowing the researching and planning were spot on and paid off." Are you ready to go tiny? Be sure to SHARE this story with your friends!